Checking the stats and we are rated , first and second fans very close. This Page is for the people that correspond with me the most, and are always adding to the content of the site. With details of the machines they have built. Photo Courtesy Martin de Vries. 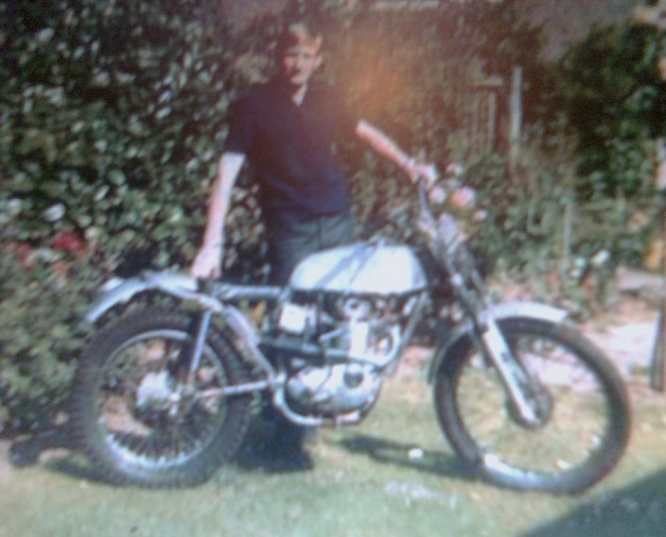 This is Martin with his BSA B40 engined John Lee built Firefly. His later bike builds are further down the page. BSA Otter’s Number One Fan. OK just been sifting through the stats and website ranking. And I am amazed that we are even rated? Well we are. And I mean to get our rating and value up next year, if I can. Looking at the number of emails sent to me over the past couple of years, it looks as if our number one fan is Mr Richard Clarke; congratulations on that Richard and keep the mail rolling in. A Close Second was Mr Martin de Vries; again keep sending the mails in. This is a message from Richard that He has just sent me. Hope this finds you well. A quick note to say, happy Christmas and an Otter New Year. Many thanks for keeping the site running with interesting projects, reports and photo’s. Let’s hope 2013, without Pillar boxes etc will be filled with great bike projects. Looking forward to LDT news. Seasonal greetings to you and all Otter site followers. 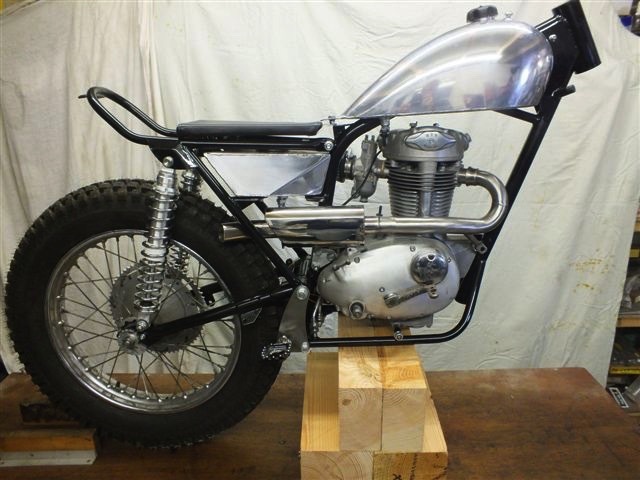 And Richard has just sent me details of his latest BSA build. But his story below confirms that. The missing two year "no starter" will be described later. Here is part One of the build,Story. We are hoping for part two shortly and pictures of the finished bike. With a life long love of things BSA, these days still in the shape of Cheney Victors and CCM’s – there came a need to find a trial bike to join his young son on his BSA Bantam at trials. Answer, get a BSA C15. There was a C15 trials bike, with an interesting history, but missing it’s front end sitting in the barn! Answer find forks, yokes, front wheel etc. This bike ran well, with a old, over weight scrambles rider on board nothing was going to stop this pair – well rider was not up to much and the bike was lacking in ground clearance, heavy and with a wheelbase and head angle not suited to today’s events. These were the excuses for not being able to keep up with a 14 year old on a Bantam – Answer must be the bike !! Looking around and having seen his mate David Dawson’s Mills BSA this had to be the answer. Problem, no Mills Frames made any more. Next, a phone call to Howard at Faber. No problem just add your name to the list. Delivery ? When I get enough orders, we will make another batch. So back to the hunt for a Mills frame and a way to get on with the need for a reasonable trials bike. After many phone calls and a number of trips, a frame jig came up. The next part of the story was long and very frustrating, but the answer was after nine months a frame that was shocking. 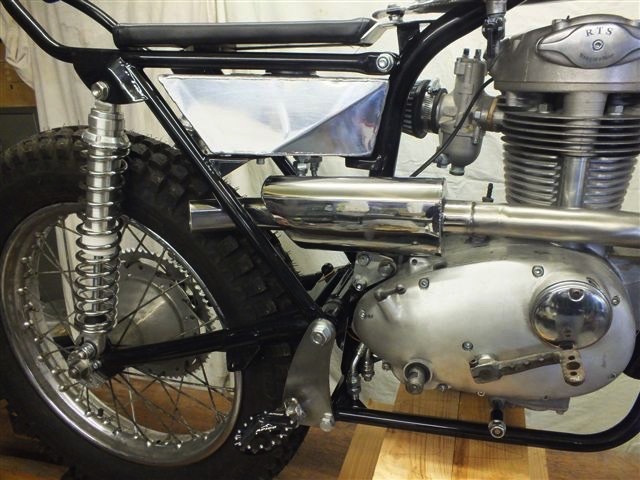 While talking to Gerry Minshall, owner of a Mills BSA it turns out he has made himself another frame and jig. Next question when and how much for another ? Not sure and not cheap. His man is about to start building his next bike for Scotland 2016, so would need to join the back of the line of people wanting the lovely bits and bikes that Gerry turns out. Over a cup of coffee he said if you want to get on with building a bike why not give Jim Pickering a call. The reply was that I want a C15 not one of Jim’s well known Bantams. It turns out the Drayton Bantam frame can now house the C15 and Triumph Tiger Cub engines and all legal for Scotland. Back home a few minutes with Google and there were pictures of a Drayton C15 from Telford – the year I did not go ! Armed with the contact details, next day a call to Jim to find out if and when he may have these frames. Answer, you can have a full Drayton frame kit in about 6 or 7 weeks. Just what was needed a full kit to build a bike, a delivery date and a very reasonable price. As promised, the phone went and a voice with a distinct Midlands accent announced your frame kit is ready, what finish do you want on the frame ? Ten days latter and a trip up North, well from Somerset most places are North. At Drayton HQ was met by the man himself. A few hours and a number of cups of coffee later with the truck loaded with all the goodies a Pre 65 Classic trials builder could need. The homeward journey passed in a blur of planning the next few hours in the workshop. Once laid out on the floor, time to find the other bits needed to build the bike. The kit you get includes the frame and swing arm already powder coated together with its bolt and bearings, footrests, heavy duty alloy sump guard, aluminium petrol tank, covered seat, oil tank, oil pipes, rear brake peddle, stainless steel exhaust and silencer, head bearing and engine bolts ! Just needed to add engine, carburettor, electrics, yokes, forks, mudguards, bars and wheels. The engine was already sorted following a visit to my BSA engine man of many years standing, Roger Taylor of RTS. Now Roger has built scrambles and grass track engine for me going back almost 40 years. A chat with Roger and a specification for a C15 based trials engine came together. Using the heavy later B25 flywheels and con rod, with a one off cast aluminium barrel and one of Roger’s superb heads. That was the engine sorted and came with a new Amal carburettor and electronic ignition. Forks, wheels and yoke soon sorted and a phone call to Garry at Rock Shocks soon had the rear suspension in hand. I find his service and the quality of the rebuildable "Rock Shock" the way forward with most of my bikes. The other bits were soon found around the workshop. That first evening, in went the engine; just to see how things will line up. It went straight in and the engine bolts slid into place. Along came the Somerset Cider apple harvest, so workshop not seen for almost three months. Huge harvest even though it started a couple of weeks late this year. Thanks so far to Jim Pickering, Gerry Minshall, Gary Flecney and Roger Taylor. The build will be in Part 2, which I hope will follow shortly. 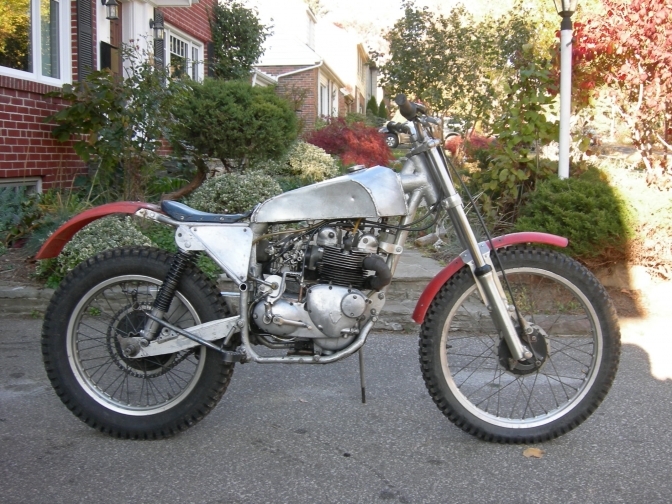 Part Two of the bike build is on the "Drayton Banstar" page. More from Richards build later,and hopefully news on the test ride, and trials on the machine. And this the story about the bikes he has built. You may remember that I was the one who answered your question on the Trials Forum about R. Langston driving up King John’s lane. I used to belong to the Leamington Victory Club and rode in a few Banbury club trials (late 60’s) when Frank Knight and John Gleed rode. Attached are pictures of my bikes as you requested. The old picture is of my Firefly framed BSA, (by Phil Jones and John Lee) I bought it in the late 60’s for about 100 pounds and originally put a B40 in it, the picture was taken around 1972. I later replaced the B40 with a C25 and put MP forks on it, it wasn’t much good at that time I knew nothing about detuning the engine for trials. I sold it soon after and bought a grass track bike (much easier to learn to ride, i.e. open throttle wide and hang on). The Triumph and BSA may not be as pretty as most of the bikes on your gallery but my excuse is that I am limited to a hacksaw, drill, hand grinder, and stick welder (+hammer of course). I have to make virtually everything myself since shipping from the UK virtually doubles the cost of parts and there is not much of a second hand market here for trials parts. For both the Triumph and the BSA I have made the frames, tanks, exhaust pipe and silencer, inlet manifolds, tanks (AL welding by others), total loss electronic ignition for the Triumph from Yamaha parts but purchased PVL for the BSA. The Triumph’s alternator has been replaced by the biggest lump of external flywheel that would fit, i.e. about the size of a 2-stroke magneto; it makes quite a difference in softening the motor. I use an E3134 inlet cam but have rotated it back a couple of teeth on the timing gears to get the inlet to open around 28 deg BTDC. The CV carb gives better idling than the Mikuni and Amal’s and it also has an accelerator pump which gives it a bit of instant go when you need it, and reduces any tendency to stall after a long descent. They both work quite well and as I said before, Mick Andrews quite liked the Triumph, but unfortunately I didn’t get a chance to get him to try the BSA since the event got hit by the edge of Hurricane Irene and we were washed out at the end of the weekend. Charlie,> what you find works best for you! The flywheel has been increased in diameter by 3/8 inch (to C15 size I think) and the CR is about 8:1 by putting a plate under the cylinder. Push rods were lengthened by knocking the steel cap off and putting an equivalent thickness spacer on top of the rod and replacing the cap (I hope this doesn’t offend your engineering sensibilities too much). The gearing was lowered with 52 t on the back wheel and a 15t engine sprocket using a half link on the primary chain. Both sprockets I made, the rear out of some hard Aluminium plate, and for the engine I ground off the teeth of an 18t sprocket leaving just the hub and welding on two 15 t sprockets. Making sprockets with a hand drill and file is even more frustrating than making frames without frame jigs. I was able to drill the chain roller centre’s accurately by using a side link as a drill guide although after about 5 or 6 holes I had to keep replacing the link due to wear. I was rather amazed that this method worked since the tolerance on tooth centre’s is rather tight. I had no choice for the engine sprocket since nobody makes a 15t and it was quicker to make the rear myself than order one from the UK, plus everything from the UK costs twice as much here due to shipping costs. As you can imagine a stick welder is not the best for welding frames particularly if you don’t have a frame jig. One has to develop a delicate touch to weld thin walls and distortion is a big problem. Charlie,> Got the Tee shirt for that one! To overcome this I have found that if I build the main loop with engine mounts first, and then fix the swinging arm pivots so that the rear wheel sprocket and engine sprockets align, and finally weld the steering head so that the wheels are aligned and the rake and trail are correct. Regards Martin, and thanks for the work you put into your web site, without people like you the past would be forgotten and we would left to ride just the current range of pogo sticks. More Pictures of Martin's Bikes and more Later OK.
Charlie,> I am amassed at the effort some of you guy's go to to achieve the machine of your dreams . And looks are not always every thing ingenuity comes before anything and a determination to achieve a goal, Well done Martin. More later and another Build.